Get maximum versatility! Allows chairs to glide smoothly, and conforms to floor and furniture differences. The only glide on the market that automatically adjusts for angled or uneven legs! Works on indoor and outdoor wooden furniture. Allows chairs to glide smoothly, and conforms to floor and furniture differences. Outlasts most chair glides, and eliminates chair wobble. Use on any wood furniture from chests to cabinets to couches and chairs. Engineer designed of a special plastic that's hard, slick and long wearing - virtually indestructible. The flex cushion conforms to leg and floor differences. Waterproof adhesive is secure and provides a reliable bond. We have a natural slate floor in our kitchen and breakfast area. Have struggled finding something that would allow our chairs to slide on the uneven surface, not mark the floor, and keep all 5 legs in contact with the floor (so chairs don’t rock). Installed these Self-leveling Glides a few weeks ago and they seem to be the solution...so far so good! We purchased these to replace the big box store guides on six (6) dining room chairs, which wear out quickly on our travertine floor and they are such an improvement! We highly recommend them and they make the chairs feel so much better and make them move easier on the floor. Very pleased with this product. Works just as advertised. Took the wobble out of the chairs and they slide easily across the floor. Highly recommended!! Have been looking for this product for years. Very slick, very easy to install. Only issue is that our 3 and 6 year olds have almost had the chairs slip out from beneath them as they stand on the chairs sometimes and lean forwards. These were attached to our dining room chairs, now the "glide" across the floor and I'm not worried about the floor being scratched. My chairs don't wobble and the feet don't fall off! Easy to apply and look great! I installed them with eaze. We have been using them now for over three weeks and the chairs slide so easy we need to be careful that they don't slide out from underneath us while sitting. Again GREAT product! WOULD recommend! Have had some on kitchen chairs for years. They have been nothing short of perfect. Have more chairs now so needed more glides. Just installed one set on wooden chair legs for kitchen and resting on hardwood floors. These are fantastic. I've tried everything from sticky felt, screw on felt, etc. Because the legs were uneven at the bottom, they would always push the felt off thru use. I was going to try sawing the legs as a last resort. So glad I tried this first. Going to put them on all chairs now. Great product. Would definitely recommend them. Great product! Works as advertised. Perfect on our hardwood floors and the carpet. Highly recommend these! Worked out perfectly. Also very easy to install! Put these on my kitchen chairs several years ago. They survived two dogs and five grandkids. A recent unusual event caused one glide to come off a chair. Delighted that it was still available. After doing hours of internet searching and ordering and returning other glides, this glide fit the bill. They were easy to install and slide effortlessly and quietly over our new porcelain tile plant flooring. Even with the grout lines and a few slightly uneven tiles, these glides find they're own level and move freely over the transitions; even with weight in the chair. Our last glides came with the furniture twenty years ago. Lets see how long these last! I put them on every chair in my house, they slide across the floor well and I know they're not going to fall off. Glad I found this product! Works well on my tile floor. I would highly recommend these glides. These self-Leveling Glides were used on a solid walnut three dwr. chest that is very heavy . they were very easy to install and are holding up well under the weight of the chest. They also adapted well to the uneven floor the chest was placed on. Went on easily and work very well. Chairs glide across the floor fast and smoothly. Would recommend to anyone! Used these years ago with great results, have now built 4 new kitchen stools and are using them again. As a shop teacher of 30 years I have graded wellover 10,000 projects or items. I'd grade these as indicated. The glides work perfect for my dining room chairs that are cut on an angle. A little pricey, but work great! Cured a ongoing problem on tile floors. I was going to pay $55 per chair for a furniture company to saw my chair legs and level them; then a friend send me a link to these self-leveling glides. I was a little skeptical at first but I bought three sets and put them on about a month ago. They work exactly like described in the overview. I have no woodworking experience at all but these were incredibly easy to attach. to get all sixteen legs angled to match the floor. on the bottoms so that the chairs would slide easier. So Far I love these. Had metal ones before, those left black streaks on the floor. Hated all the felt ones they just collected dust and pet hair. The kind the slips over the whole leg??? Those torn to pieces in the first week. These are great compared to all the others I have tried. These were very easy to install, and are perfect for our oak chairs that have legs that do not have ends cut parallel to the floor. We have no marks on our tile floor, and no more screeching noises thankfully! We ordered six sets and are very pleased with the purchase. Easy to install, look great on the chairs, work very well. Have tried several other products - like these the best. The glides are very easy to install.The foam ring serves as a noise eliminator when chairs are moved over tile floors. This feature impressed me more than any other, although the units are well designed and built. I have ordered eight sets and may be ordering more in the future. The only product that worked! Really!! After trying many different glides for our heirloom kitchen chairs theses are the ones that work perfectly. I am so impressed with them, I have purchased more to use on other furniture in our home. Trust me you will not be let down! They work well and were easy to install outside of getting the backing removed from the foam. These work very well so far. I have had them a few weeks. Make sure to keep the floor clean so dirt doesn't get stuck under them and scratch your hard wood floors. We used on shorted bar stools to fit under a new counter, these worked great in leveling my not so level multi angled cuts. Works great for chair legs with small diameters. I wish they made another size for chairs with larger legs. I just hope the adhesive on the foam, holding the two pieces together holds up. Easy to install on antique chair legs that were far from "flat". Installed them on four wooden kitchen chairs. The installation was very easy. Hopefully, they will be durable. The only negative is that the chairs now slide very easily due to our Armstrong Aterna flooring. I hope this slipperyness will diminish with use. These guides are working very well. I would recommend them. You do have to be careful to align the adhesive sponge to the plastic cup and adjoining part, you only get one shot at this! Went on easy. Just what we needed to protect the laminate flooring. This is the second time that I've used these guides and they were very easy to install. The first set was installed three years ago and have held up well. I would give them five stars but feel the product is a little over priced, so will only give it a four rating. These glides are different from what I have tried before. They look like what I have been looking for in the past. So, I would like to try them out. If they work well, I will buy several more in the near future. Replacement for work out felt glides and these fit angled chair legs better. Had these before, not sure how long, but they are starting to fall apart. These are the only glides that work on our new Mannington floors. I chose these because they are the only self-leveling glides I found and they received good reviews from other buyers. I have used these before. Only ones that would hold up. Love them. They stay level all the time and are tough. Also this is the only place that carries them. Don't bother looking anywhere else. These are the best guides we have ever found. They appear to be what I am looking for. Out new dining room chair wobble. Best item for my needs. My wood dinette set chair legs began scratching the wood floors several years ago, so I bought self-leveling felt pads. They were OK, but when they needed replacing, the glue stuck tot he legs, so I ground off the glue several times with a belt sander. Each time the leg ends became a bit more uneven, and the felt pads would side-slip quickly. I had to level the legs, and being a bear of small brain I did not know how. Then, I saw your self leveling glides, bought a set, and I am pleased. Hoping to solve an uneven chair or floor issue. Good reviews and they look like they'll fit my chairs with angled legs. Wish they came in a lighter color though. Although they are very expensive and shipping high, I'll give them a try. Promo code useless. need to complete set of chairs presently in use. Looks like a well made product. The legs on my kitchen chairs were not cut level with the floor, this product should solve the problem !! I tried a set and this product is the only one that works on my chairs. I am ordering more for the other chairs. this was the only place that I could find self leveling feet of any quality. Looking forward to see how they work. Looking for help with my chair glides after I moved since we lost them along the way! they work very well and are easy to install. The do a good job of levelling slightly uneven chair legs. Felt glides come off the chairs and make sticky marks on my brick floor. Chair legs are decorative and glides that slip over the bottom of the chair leg do not work. To replace broken part on a chair. If they work like you say, they are what I need for my kitchen tile floor. 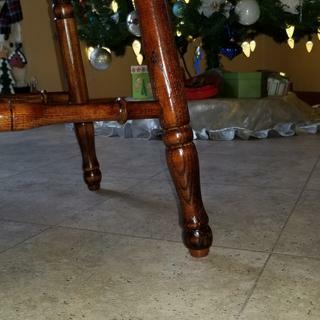 We have angled dining room chair legs.No matter what kind of pad you apply to the legs,they wear out than chair will scratch the hard wood floor. This looks like the solution to our dilemma. New product to me. Making a wooden stool and will try them on it. What protects the floor from the mounting screw? BEST ANSWER: See picture. The mounting screw attaches the plastic "cup" to the chair leg (drill the pilot hole carefully). The foam "washer" separates the mounting screw and "cup" from the plastic "foot" that contacts the floor. We have ours on hardwood flooring and it moves smoothly and leaves no marks what-so-ever. The mounting screw is housed in the outer cup. 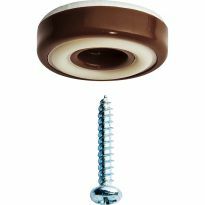 A sponge rubber insert and the inner leveling cup keep the screw head from ever contacting the floor. These are by far the best of many glides we have tried. They are recessed below the surface. Anyone know Screw diameter and lenght ? BEST ANSWER: I bought and installed these almost a year ago, so I cannot measure them for you. Going from my memory, though, I would estimate the diameter to be either 1/16" or 1/8", and the length about 1/2". They are fairly small screws. I have found the glides to be quite good. They have lasted longer than anything I have used on these chairs before. How many come in a set? BEST ANSWER: 4 per set so you need to buy a set for each chair. They work as advertised. This was the only option I could find that self adjust and had positive comments. there were 4 per set.One per chair for 6 chairs.Plus we bought a few more packs for some other chairs. 4, as stated in the technical details. Will this work on melanmibe furniture? BEST ANSWER: I have mine on wooden chairs.I do not know if they will safely work on melamine furniture.I also have some on fiber board furniture as well and it is working just fine.I still have mine on and they have helped a lot. Is the bottom of the glide felt or nylon? BEST ANSWER: Not sure what the material is, but it appears to be a soft plastic-like material. It slides easily on the floor and does not leave marks. One caution: we have saltillo tile floors and they don't hold together well when sliding over grout joints. I have had to "repair" them several times using mounting tape. That being said, they do work. The entire glide is plastic. Does not scratch my wood flooring at all. Best glides I have ever had on our chairs since they do not fall off or wear out quickly as the felt ones used to. It is the same material as the rest of the chair glide - not felt. 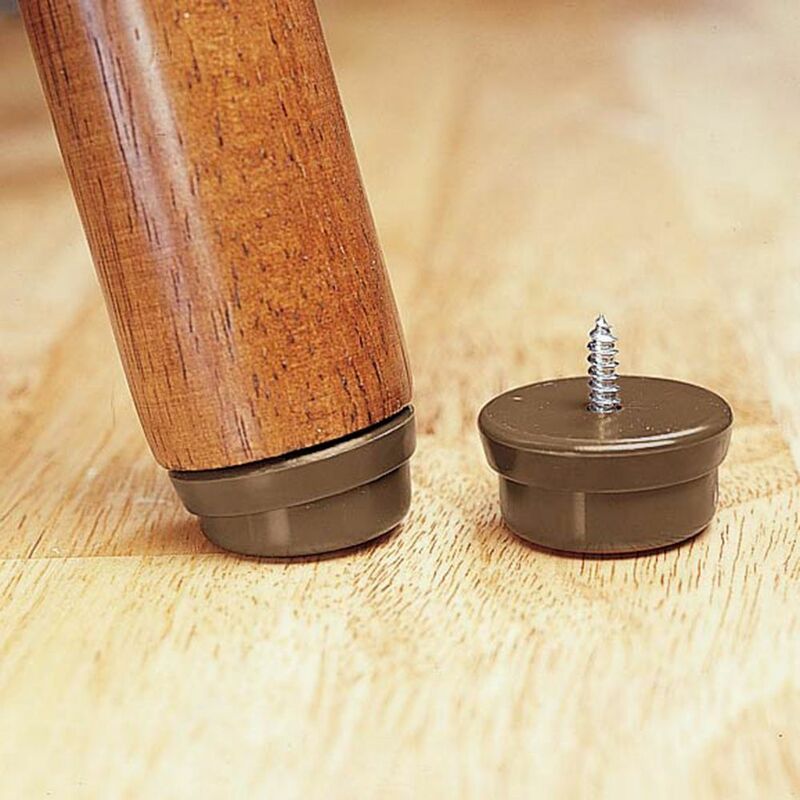 These chair glides attach firmly to the chair leg and allow the chair to move smoothly over our wood floors. It is nylon. I had been advised that nylon is the best for wood floors. Felt has a tendency to pick up dirt and grit and then scratch the floor. These glides worked great. The bottom of the glide is not/not felt. It is hard plastic of some kind, perhaps nylon. Does it move easily on carpet? BEST ANSWER: They slide all right on carpet. I've had them on dining table chairs that we use 3 times a day for last 4-5 years. I bought the glides for our kitchen chairs that are on hardwood flooring and they self leveled and work very well. If I were to use them on carpeting , I would self level them on a hard surfaced first then put chair on carpet. ONLY USED ON HARD FLOORING. SORRY, I CAN'T HELP. I use the glides on linoleum in the kitchen. Will these work on bar stools with square legs? BEST ANSWER: I cannot see any reason why they would not work, they will be a bit slippery on a hardwood or tile floor. I have used them for years of ceramic floors. They will. Make sure the sides of the legs are slightly larger than the diameter of the slides for aesthetic reasons. Yes, I installed them on 5 chairs and 3 barstools and they work well. I am very concerned about my Windsor chairs scratching my red oak floors. Will these glides prevent scratching? Yes they will prevent scratching, at least on bamboo flooring. We had the same concern, but have found them to work perfectly for protecting our bamboo flooring. Sorry I do not have oak or wood floors - I got ceramic tiles and they worked pretty good; I haven't notice any scratching at all. I have had no problem with these scratching our red oak floors it has been about two years now since install. I am looking for a swivel or self leveling feet to attach to oak chairs that are on carpet. The angle of the base of the chair leg cuts into the carpet, unevenly distributing the chair weight. Would these solve this problem? BEST ANSWER: These self-leveling glides are the answer to your prayers. I love not having to lift the chair every time I get ready to stand up or sit down. Not sure. Ours are on tile. But I think the feet are flat enough that they shouldn't negatively affect the carpet. Possibly, I really like them. They are good quality. I use them on tile floor though...not carpet. Are they safe for linolium? BEST ANSWER: I’ve used them on hardwood floors and wood laminate floors with great success, and would purchase them again without hesitation. While I haven’t used them on lineoleum, I believe they would perform equally well. Thank you. I am going to give them a try. how does a screw hold in the end grain of wood? BEST ANSWER: I have used this product for years, I have not had a problem with the screws pulling out of the wood. Works great, I've had them on 6 kitchen chairs for 2 years now. None are even remotely loose. Thank you, can you tell me the screw size, e.g. 6-8-10? will this glide slide over carpet tile? BEST ANSWER: I would think that they would. Should not be a problem at all. Yes, they hold on better than any other glide I know of. Yes. As long as the nap is not too thick. I have very uneven reclaimed french clay tile with wide grout. I've tried felt bottom, plastic bottom etc. What do you recommend? I have metal bar stools with plastic inserts .Will they screw into these inserts and hold?